Beautifully restored Victorian hotel in the heart of the historic district Port Townsend. A once former bordello with most rooms named after former working girls including Madame Marie's suite and Miss Kitty's room. The Palace Hotel is located one block from the ferry dock in the center of many fine art galleries, restaurants, theaters, antique stores, and unique gift shops. Welcome to the Palace Hotel Port Townsend, a Magnuson Hotels affiliate. Port Townsend is rich in history and charm. Come marvel at our Victorian architecture. Enjoy a stroll by the marina or on the beach. Kayak, fish, or take a whale-watching cruise. Bicycle or hike in the Olympic National Forest. Each room is uniquely decorated in a Victorian theme, and furnished with antiques and collectibles. Our spacious guest rooms vary from European-style accommodations to two-room suites. Many rooms have magnificent views of Port Townsend Bay or the historic downtown. Soak in a Jacuzzi or old-fashioned six-foot claw foot tub featured in many of our beautifully restored rooms. 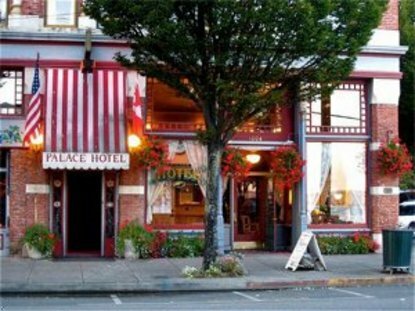 Palace Hotel Port Townsend accepts Visa, MasterCard, AMEX and Discover.